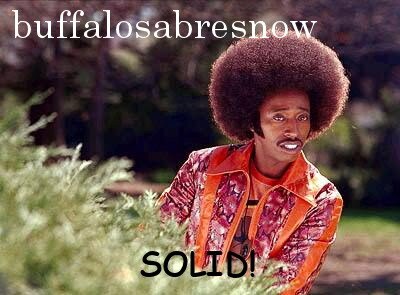 buffalosabresnow: Sabres trying to get into the win column. Eichel in beast-mode. Sabres trying to get into the win column. Eichel in beast-mode. It just hasn't been in the cards yet for the Buffalo Sabers and new head coach Phil Housley. 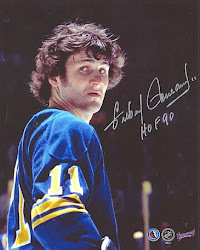 Five games into the season the Sabres are winless at 0-4-1 and they're still looking for players other than Evander Kane (4 goals,) Jason Pominville (4,) Jack Eichel (2) and now Zemgus Girgensons (1) who are capable of scoring. In all, that foursome has tallied 23 of Buffalo's 28 points this season. If it ain't one thing, it's another for this club so far. The good news for the Sabres is that Eichel is fully engaged and is playing like a player who knows that he needs to carry the team for a while. Eichel is off to a rambunctious start with seven points (2+5) in five games which ties him with Kane for the team lead. Last night he assisted on Girgensons' goal in the first period then tied the score at 2-2 in the third with one of his own as he barreled to the net and calmly deposited his own rebound. That's what happens when your line doesn't score. Perhaps the recall of Rochester Americans forward Justin Bailey will be a kick in the pants for someone. Bailey is off to a strong start for the Amerks with two goals and a plus-2 rating in three games. The recall also represents another opportunity for Bailey himself. The 6'4" 214 lb. Buffalo native has had numerous opportunities throughout the last two seasons with the Sabres but has only been able to scrounge up four points (2+2) in 40 NHL games. Bailey's had some very good games without hitting the scoresheet, but the Sabres need a little more from him. When the team gets back from their road trip, which ends with a Tuesday night game in Las Vegas, a few players may be up for re-evaluation and that includes Griffith and defenseman Matt Tennyson. Both players have been given an opportunity to show stick with the Sabres but neither have given the team a reason to keep them up outside of injuries. One younger player, 24 yr. old rookie defenseman Victor Antipin, has already been relegated to the press box after a rough start to the season. Antipin was replaced by veteran Josh Gorges who helped stabilized the defense corps. Housley himself also needs to do some self-evaluation. Having Griffith out there with less than a minute to play and the goalie pulled last night was a head-scratcher and I'm not sure where his faith in Nathan Beaulieu (zero points in five games) comes from either. With Zach Bogosian and Justin Falk out with injuries, players like Beaulieu and Tennyson are in the lineup and have been put in positions above their talent-level so Housley pretty much has no choice. But some of the choices he's made with his defense-corps, which includes second-pairing minutes for Tennyson, seem rather questionable. Most importantly for Housley, he needs to find a home for Reinhart who's an absolute mess out there. Reinhart scored 40 goals and 89 points over the last two seasons while playing on Eichel's wing and the manning the front of the net on the first powerplay unit. Housley had him centering the third line to start the season and now has him on Larsson's wing but regardless of where he's been, Reinhart's confidence level seems to be reaching a low not seen since his nine-game NHL debut in 2014-15. That said, tonight represents another chance for Housley to get his first win as a head coach and it comes against an Anaheim Ducks team that they've had at least some success against. Last season the Sabres toppled the Ducks 2-1 on the road in the shootout as goalie Anders Nilsson got the win, Ryan O'Reilly scored Buffalo's only goal (from Jake McCabe and Eichel,) and Girgensons ended a 10-round shootout with the game-winning tally. Word from Anaheim is that Housley announced Chad Johnson as Buffalo's starting goalie. Dan Arritt of NHL.com calls Johnson one of his Players to Watch saying this of the Sabres goalie, "Johnson made 44 saves in a 3-0 win at Honda Center on Dec. 17, 2015, a Sabres record for saves in a regulation shutout." Housley also said, according to WGR550's Paul Hamilton, that Bailey will be in the lineup but there was no indication from the coach who would be out of the lineup, save for Kyle Okposo who remains ill.
Game time is 9:00 pm EST, with pregame at 8:30 pm.